For the Agent, see Lady Eliza Farrow (Agent). Artwork of Lady Eliza Farrow. 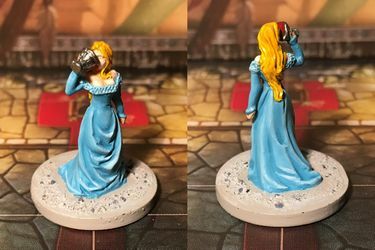 Lady Eliza Farrow is a lieutenant in the Descent: Journeys in the Dark (Second Edition) base game. Whereas her husband found a way to cheat death through the use of his necromantic magic, Lady Eliza Farrow has found immortality as a vampire. By feeding off the blood of others, Eliza can exist forever in a state between life and death, possessed of undiminished intellect and beauty, but perpetually driven by her boundless hunger. Lady Eliza Farrow appears in The Shadow Rune and Heirs of Blood campaigns. Her Lieutenant Pack includes the plot deck Endless Thirst, which empowers monsters with the Dark monster trait, and enables Lady Eliza to be used in any campaign as an agent. Sacrifice: Deal up to 5 to an adjacent monster to allow Lady Eliza Farrow to recover an equal amount of . Seduce: You may choose a hero within 3 spaces of Lady Eliza Farrow and test Eliza's . If Eliza passes, move the hero 1 space in any direction and the hero is Stunned. Wail: All heroes within 3 spaces of Lady Eliza Farrow must test . Each hero that fails suffers 2 . Blood Call: Lady Eliza Farrow recovers equal to the amount of dealt with this attack (after rolling defense dice).